Now LittleBits, the New York start-up that sells small, magnetized parts akin to electrically-charged Legos, wants to help keep your kids occupied this holiday season. 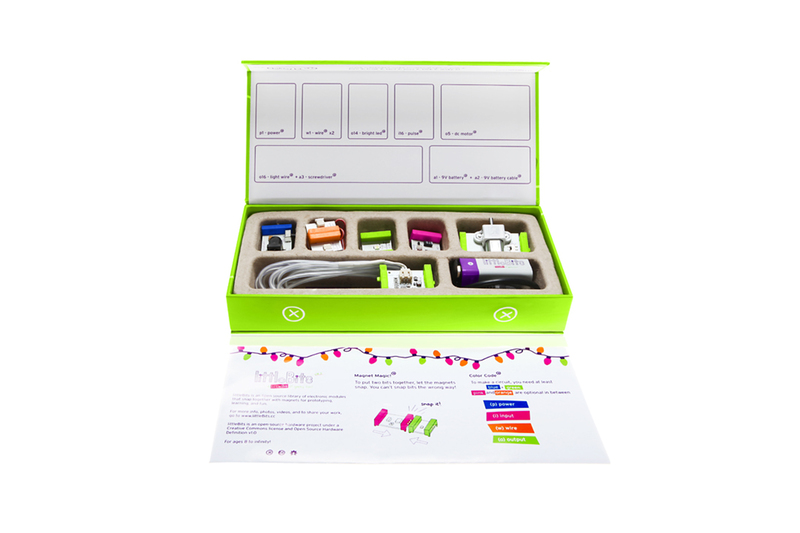 The company is introducing its newest LittleBits kit, a holiday-themed set that includes three new “bits” geared toward making things like light-up ornaments, electric candles and a tree-topping star. The new kit includes live wire, a flexible neon-like component, an LED light and a DC (direct current) motor. The holiday kit, which the company will sell through the end of the year, costs $49. LittleBits is launching this alongside a contest in which kids — and adults — can submit their best holiday creations and win more bits. LittleBits launched in September 2011, and now sells four kits, ranging in price from $29 to $89. This past summer, the company raised more than $3 million to fund expansion. Creator Ayah Bdeir, an MIT Media Lab alumna, said LittleBits has sold 10,000 kits to date. LittleBits joins the ranks of products like NerdKits and the Hummingbird kit from BirdBrain Technologies, which enables kids age 10 and up to build their own robots.